We are a top notch supplier of National Zero Till Happy Seeder. We are a top notch supplier of Happy Seeder Machine.10 tine turbo happy seeder. Our reputed entity is engaged in supplying HAPPY SEEDER. Product description: Being a foremost organization in this industry, we are actively engaged in offering the finest quality range of Happy Agricultural Wheat Seeder. 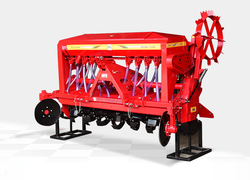 Being a foremost organization in this industry, we are actively engaged in offering the finest quality range of Agricultural Happy Seeder. - Possibility of sowing wheat crop just after rice harvesting i.e. option for long duration wheat and rice varieties. - Possibility of sowing wheat in the residual moisture i.e. saving of one irrigation. - Timely sowing wheat even after long duration basmati rice varieties. - Crop residue as much helps in moisture and temperature conservation. We are a top notch supplier of Happy Seeder.